Wicked Reads: Happy Holidays from Wicked Reads! 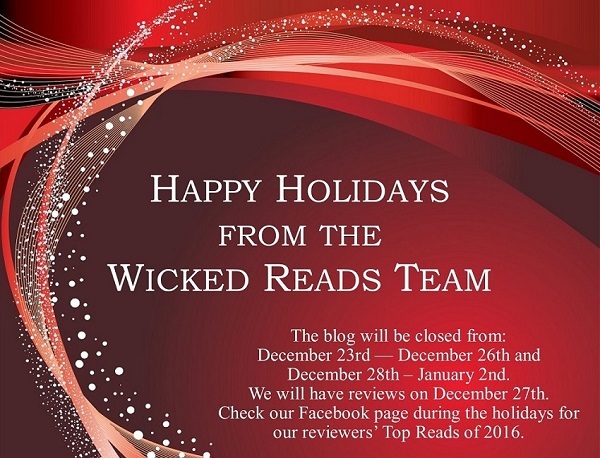 The Wicked Reads Team would like to wish you a Happy Holiday season. The blog will be closed from December 23rd to December 26th. On December 27th, we will have reviews for a few new releases. We will then close again from December 28th to January 2nd. So stop by on December 27th and come hang out with us again on January 3rd. During the holiday break, we will have the occasional post on Facebook as well as the unveiling of our reviewers' Top Reads of 2016. So please join us on Facebook. On a final note, we want to thank our followers for another great year. We're glad that you love books as much as we do. We hope you'll join us in 2017 to see what the world of writing, our favorite authors, and the soon-to-be discovered authors have in store for us.